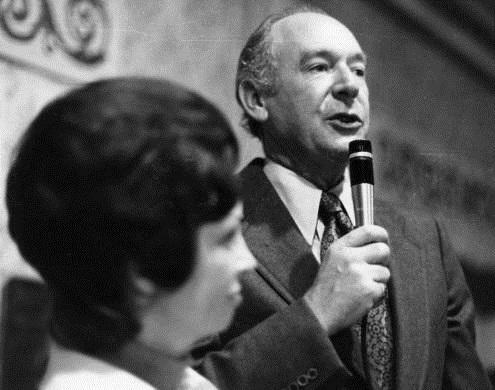 Idaho Governor Cecil Andrus gives a speech after winning the 1974 election. His wife Carol is beside him; they married in 1949. 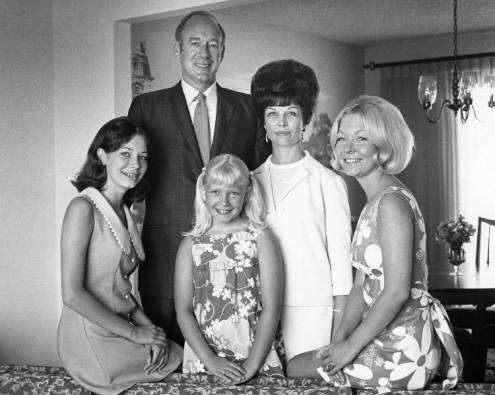 Family photo of (Left to Right) Tracy, Cecil, Kelly, Carol, and Tana Andrus. Governor Andrus delivers the 1972 State of the State Address. 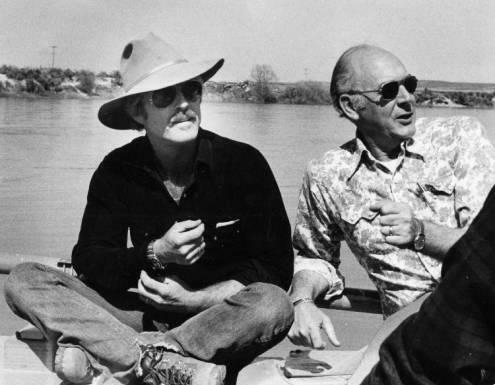 Robert Redford and Interior Secretary Cecil Andrus on a float trip down the Snake River on behalf of preservation of Snake River Birds of Prey Area in Idaho. 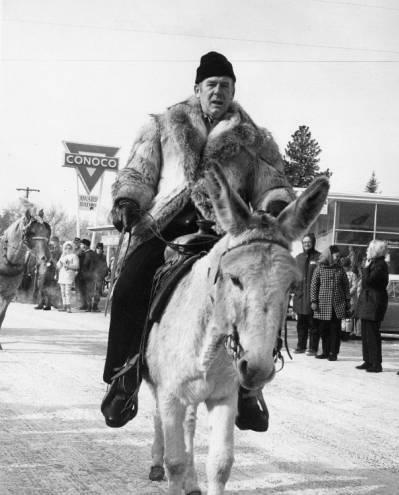 Governor Andrus rides donkey in McCall, Idaho. 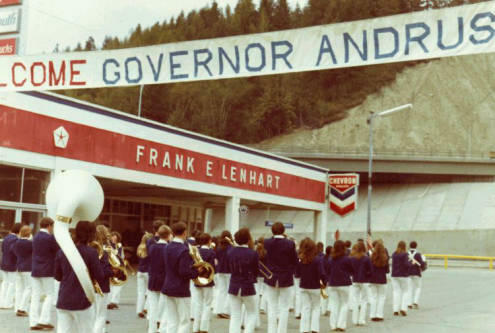 Although he would go on to serve as governor over three separate decades and Interior Secretary in the Carter Administration, Andrus came from humble beginnings in Hood River, Oregon. Governor Andrew speaks before the flag. Born August 25 1931, Andrus was a Depression baby. His father used to hook up their car battery to the family radio so they could listen to President Roosevelt’s fireside chats. After some time in the Navy during the Korean War, he and his wife Carol moved to the timber town of Orofino, Idaho, where Andrus became a logger. Gary Moncrief with Boise State University says that part of his life was formative for his political career. And like many young Democrats in his generation – Andrus was inspired by John F. Kennedy. So in 1960 he ran against a Republican incumbent for the Idaho statehouse and won. “This is a guy who understood politics extremely well in a period in which he was always a minority party governor – he was pretty successful," says Moncrief. This photograph was taken during the "Andrus for Idaho" campaign. Andrus was a Democrat during a time in Idaho politics when the partisan divide was a lot narrower. The first time he was elected governor was in 1970, and he made conservation and the environment a key part of his political career. Here he is during his third inaugural address at the state capitol. 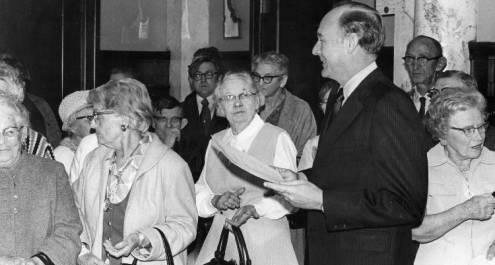 After winning re-election in 1974, Andrus was asked to go to Washington and lead the Interior Department. 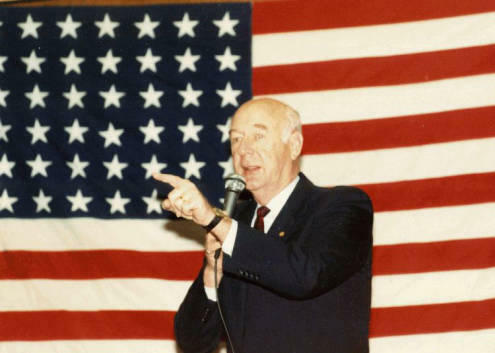 As a member of President Jimmy Carter’s cabinet, the Idaho politician found himself embroiled in a number of controversies – including the national gas shortage crisis. During a 2011 interview with Idaho Public Television, Andrus said that his proudest accomplishment was steering the preservation of more than 100 million acres in Alaska. But although he worked for the federal government for a stint, this didn’t stop Andrus from taking on the Department of Energy over storing nuclear waste in Idaho. In a bold move in 1988, the Governor ordered the most imposing state trooper his staff could find to block a train car full of radioactive waste from reaching the Idaho National Laboratory. He ordered state police to hold the waste in Blackfoot – though the legal authority to do so was dubious. Marc Johnson, a senior staffer at the time, recalls his conversation with the governor. The stunt worked and the Department of Energy backed off – at least for a while – and the story was splashed across newspapers including the New York Times. 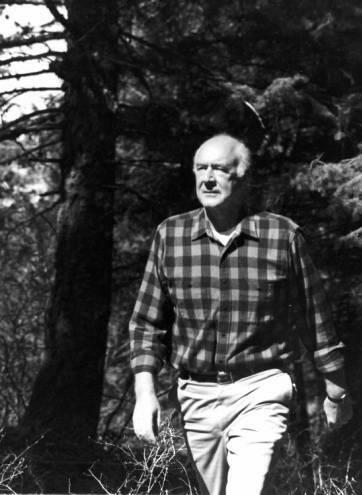 Governor Cecil Andrus fishes during a 1990 trip to Meadow Brook. Andrus remained an avid outdoorsman through his entire life, hunting, hiking and rafting all around the state. 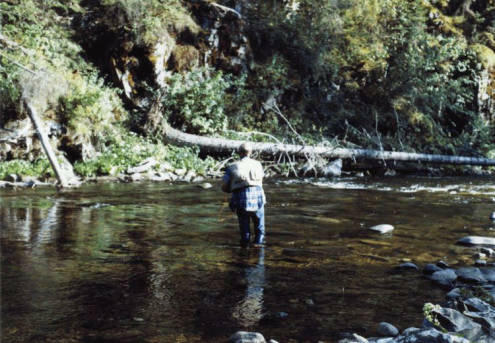 He lead President Carter and his wife Rosalynn on a float trip down the Middle Fork of the Salmon River. And during one memorable elk hunting trip in 1991, he was kicked in the head by his own pack mule. He also stayed deeply involved in Democratic politics, introducing then-presidential candidate Barack Obama to a boisterous Boise crowd in 2008. And to Marc Johnson, the life of his former boss is now inextricably linked to the history of the state. 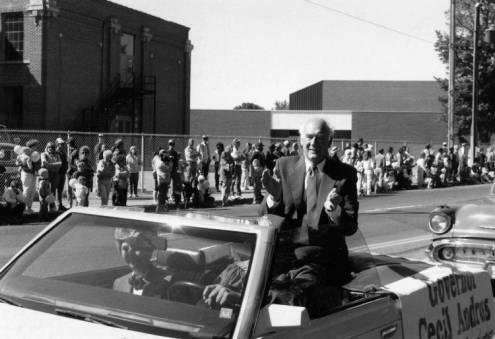 Cecil Andrus rides in car during the 1984 campaign. 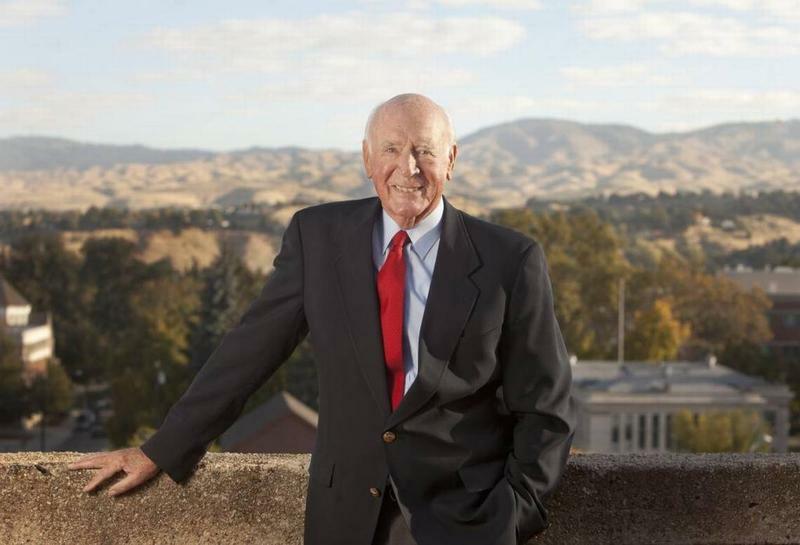 The public lying in state ceremony will happen at noon Wednesday Aug. 30 in the Idaho Capitol rotunda, followed by a public memorial for Andrus Thursday Aug. 31 at 2:00 p.m. in the Jordan Ballroom at Boise State University. Special thanks to the Special Collections department at Boise State University.